From our showroom in Crofton, Wakefield, we are your local specialists in cleanburn wood burning and multi fuel stoves, chimney systems and accessories. With stoves in our own homes, we want to help you choose the best stove for your home and to create the fireplace that you have always wanted. We offer a complete service to include stove supply, HETAS approved installation, hearths, fireplace alterations as well as full after sales care from our showrooms, open 6 days per week. 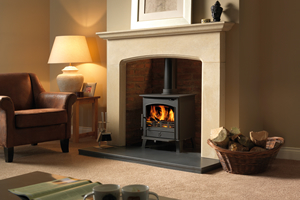 We supply a wide range of wood burning stoves from traditional to modern and we are also quite happy to install stoves that are purchased either online or from another stove shop. We will gladly assist you in choosing the right model to suit your tastes and needs. We operate throughout the Wakefield, Pontefract, Castleford, Doncaster, Harrogate, Leeds and Barnsley area and offer free surveys and consultations. The range of stoves on our website and shop is just a small selection of stoves that we recommend. We prefer to discuss our customer’s requirements in person as we know how hard it is to select a stove from a website only. Please feel free to contact us to discuss your requirements and arrange a free survey and quotation. We have been chosen as stockists for ACR, Broseley, Burley, Dunsley, OER, Town & Country, Firebelly, Hunter, Parkray and many more. We are specialists in DEFRA approved stoves and our stove range has been carefully chosen to cover the finest quality, design and efficiency - as well as value for money. As approved dealers who do not sell online, we can offer you the manufacturers full warranty as well as replacement parts and stove advice. A wood burning stove allows you to heat your home using a genuinely renewable and natural fuel in the most efficient way possible to provide maximum heat with minimum emissions. Our ethos is to represent the most efficient, clean burning and the most ecologically sound brands and products on the market. Every stove we supply is between 75% and 89% efficient meaning you won't be losing all your heat out of your chimney. "Simon just dropping an e-mail to Thank Everybody that's associated to Firehouse. From the Pre-Planning Stage to the Installation 0f the Stove was with out doubt done in a highly Professional Manner. Its great to be involved with a Business that actually Delivers." "Superb job, neat and tidy, lovely red hot stove." "Great Stove, good fitter, would recommend." — Mr & Mrs Barker. "Thankyou Simon Bilbie. The Fire House. I love it." You can contact us using the details below or go to our contact page to send us a more detailed message.